New survey results presented at the ACP 2019 Internal Medicine Annual Meeting in Philadelphia, PA, today showed that 51% of ACP internal medicine physicians and subspecialists have at least 1 form of telehealth service available at their work. The finding, which categorized telehealth services into being either video visits, e-consults, remote patient monitoring, remote care management/coaching, or patient wearable data integration, indicate the growing embrace of remote coverage measures provided by practices and institutions. The organization’s survey also showed increased interest from physicians looking to implement better telehealth practices into everyday care, President Ana Maria Lopez, MPH, said. The APC surveyed a random sample of 1449 members from October 2018 to January 2019. Patients were aged 65 years and younger, and were gauged on their overall and individual telehealth category use. The investigators received 233 completed responses (16.1%) from members in outpatient care as well. Among the telehealth options, e-consults were most widely implemented (33%), while remote care management (24%) and video visits (18%) were also common among physicians. More APC members (17%) expressed interest in implementing video visit technology to their practice than any other technology. Just 9% of physicians reported using wearable data-tracking technology at their practice, and only another 9% expressed interest in the technology. Among the provided reasons for why a physician may not use available virtual care options, 42% of physicians said it was due to the challenge of integrating telehealth into practice workflow. Another 36% stated patients do not have access to supporting telehealth technology, and 29% stated concerns about potential medical errors. When gauged for their telehealth adoption versus usage, physicians reported varying difference. Among those with video visit technology, just 19% use it every week—compared to the 50% of remote care management adopters who use the technology weekly. Regarding their role in telehealth service, 24% to 34% said they were unsure or are not in charge of implementing the service in their practice, depending on the technology available. 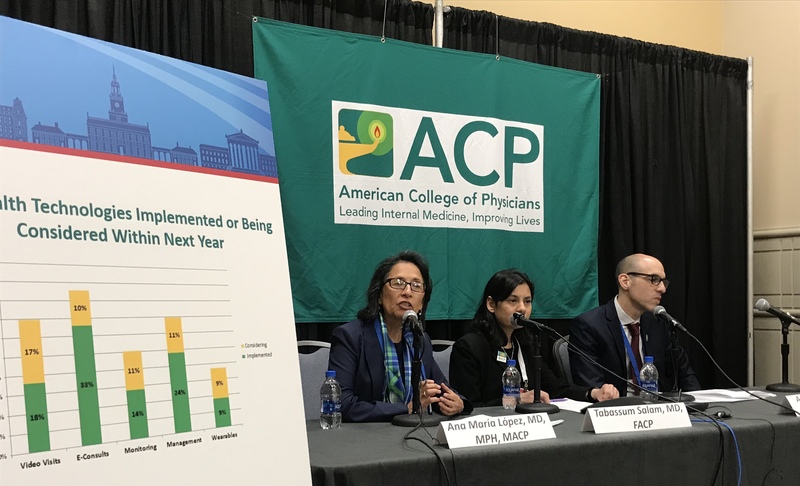 Uncertainty of telehealth integration was a recurring theme found in the survey results, Tabassum Salam, MD, ACP vice president for Medical Education, explained. More specifically, physicians want to better understand which patients are ideal candidates, and how to change their own procedures so telehealth is a properly integrated addition. From there, the ACP intends to expand into other telehealth practices “as the technology matures.” The organization hopes their measures will align physician understanding and use of telehealth with the increasing interests of patients. The information and educational resources made available will likely come in multiple modalities, Salam said. That said, technology integration is potentially available through multiple electronic health record (EHR) systems that physicians currently use. Improving understanding of virtual visit capabilities and limitations through those systems may give them better insight into what can and can’t be done with telehealth at their practice.